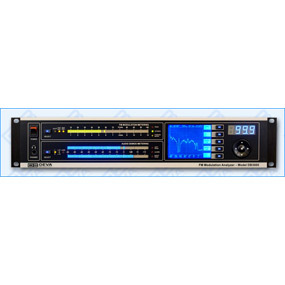 The DB3000 FM Modulation Analyzer is a digital FM demodulator and modulation analyzer. The RF (IF) and MPX signal is digitalized as soon as it enters the device, and all signal processing is then made through calculations. The signal being digitalized at the input, the equipment acquires measurement reproducibility over time. Digital filters’ accuracy, used in this equipment, enables the FM multiplex signal’s components to be accurately and repeatedly reproduced from one device to another, i.e. the same signal applied to two devices would give the same result. The processing power of this equipment enables all measurements to be refreshed simultaneously and synchronously, thereby allowing for detailed readings of all the Multiplex FM signal components. DB3000 incorporates easy to read, high-resolution bargraph displays that allow reading the main signal parameters at a glance. The built-in DB3000 Oscilloscope represents the observed signal change over time, and enables you to visualize the most important signal components involved in the process of demodulating and stereo decoding. The Spectrum analyzer likewise the Oscilloscope mode, is a mode for spectral analysis of the input signal and part of DB3000 features. The Spectral components of the selected signal are determined on the basis of Fast Fourier Transform. MPX Power measurement, supporting measurement history data is yet another DB3000’s impressive feature. Additionally to the list of DB3000's features, RDS information that is contained in the processed MPX signal is easily visualized and represented as RDS/RBDS Data and RDS/RBDS Statistics. Adjustable Alarm settings enable Alarm Signal for the most important signals and signal components and parameters to be generated and fed to the Rear Panel Alarm Terminal for remote alarm notification. DB3000 is designed to support RS232, USB and LAN communication interfaces, allowing flexibility in remote connection and control of the unit. Dependable off-air monitoring enables you to keep an eye on other stations in the market as well as measuring the important parameters of your own signal. Incorporating all the necessary features at a very affordable price, DB3000 is the best FM Mod-Monitor and measurement tool ever made.